Here at Lucky Marble, we focus on developing products for the average Small-Business or Personal/Hobby user, looking to have a website with a "cadillac" look, without the price tag associated with a high-end custom-built solution. Where does the name "Lucky Marble" come from? The short story is, it represents the logo we used for i3dTHEMES.com which we have used for many, many years. Before the company was known officially as "Lucky Marble", we were a proprietorship (Interactive 3Designs) and i3dTHEMES.com was our company website. We have since grown to do more than just "website themes/templates", but still run our i3dTHEMES.com website. From a humble beginning in a 13x7 workshed, belonging to one of the founders' of the company, LM has grown many times over (and into larger, air-conditioned, heated, office space). The principles which the company were founded on -- honesty, fairness, quality, value -- are the same which drive the company today. 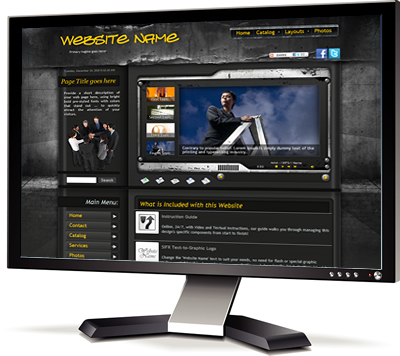 Our web templates are designed from the ground up by a team of designers who focus on both form and functionality. Now in our 9th generation of web template architecture, our designs have been refined to adhere to the latest in web standards and use the latest web technology. Available in formats for FrontPage 2003, Expression Web, SharePoint 2007, or Dreamweaver, users have several choices in the website editor that they can use to maintain their website. Sometimes users will want more functionality than that which is included within a standard web template package. Since 2005, we have developed, re-developed, launched and refined a suite of website plugins which can be integrated into our designs. What is a website without a place to put it? Since the very early days of Lucky Marble, we felt the need for cut-to-the-chase, straight-and-simple, no-frills web hosting. Web hosting that our typical customer needed. Web hosting that was reliable. Web hosting that we could whole-heartedly recommend. With a million-and-one web hosting companies out there to choose from, it can be hard to know the good from the bad. Finally, in 2008 we decided to bite-the-bullet and set up a division within our company that specializes in the needs of our typical customers when it comes to hosting. Since then, we've helped countless individuals get their site online. What happens when someone needs a website, but has no experience, and no desire to learn how to use the typical web tools to complete a website using a web template? Answer: they use a Content Management System (CMS). What a CMS does, is that it simplifies the management and editing of the website, such that a user only has to "log in" to their website with a web browser. In 2010 we launched our WordPress Themes, which are convereted web templates that will work with the latest WordPress engine. WordPress is one of the internet's most popular blogging and CMS. The beauty of it is that it is free, (you don't have to buy it), and it is included with most web hosting plans already. We have simplified things already, and if you were to get a WordPress Theme from us, you can sign up for web hosting, and our system will auto-magically deploy the WordPress Theme into your new web space. All you have to do is follow our video instructions which will show you how to set up your pages, menus, and configure the images with the administrative web interface. PageSpeed optimization is the process of implementing optimization suggestions to your web pages, as provided by the Google PageSpeed Insights tool. Unfortunately, manual optimization of web pages is time consuming and often very technical. We provide a solution that automates the PageSpeed optimization process, for both traditional websites, and for Google Pagespeed optimization WordPress. In 2016, we developed and launched a product called Numo Accelerator. This product is a server-side plugin that automatically implements PageSpeed optimization techniques to your entire HTML website. Numo Accelerator requires very little intervention on the part of the webmaster. Within minutes, the Numo Accelerator website module can be installed and optimizing your website to boost your Google PageSpeed score into the "excellent" zone of website scores (85+). In 2017, we took the code-set that was developed for the Numo Accelerator plugin, and built a software-as-a-service platform called Pegasaas, that handles much of the heavy lifting that is required to optimize a website for Google PageSpeed. Together with a lightweight WordPress plugin (Accelerator) that was developed at the same time, Pegasaas Accelerator can automatically optimize an entire WordPress website, for Google PageSpeed, in minutes with zero coding required by the webmaster. Since 2001, we have provided products and services globally. Having now served over 20,000 customers in more than 85 countries, our designs are engineered to make the process of getting a professional and unique looking website online as easy as possible. Our designs are extremely unique, and come with a user-friendly adminstrative area for those who wish to manage their own website. With plans starting from $599, we can get your redesign done at an affordable price, and have it look like it cost ten times as much.